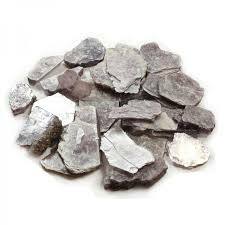 History/Mythology: Lepidolite was first recorded in the eighteenth century by Abbe Poda who named the stone ‘Lilalite’. This was done to create a wordplay on the name using its colour (lilac) and the Hindu word ‘Lila which means ‘play, game’. Later the mineralogist Kaproth renamed the stone as Lepidolite which means scale stone. Lepidolite cleans electromagnetic pollution, good for computers. Dissipates negativity and is a calming/soothing stone. Accesses Akashic records. Reduces stress and depression. A stone of transition, calming and supportive during deep emotional distress. Healing – Strengthens immune system, joint pain, relieves exhaustion, epilepsy, Alzheimer’s, Bipolar and anorexia. Lepidolite should be worn on the body. Can be used in all meditations to assist with connecting with higher self and finding inner peace. Placing a stone under your pillow will help you sleep better and assists with calming disturbed sleep. Laid a piece directly on painful joints/parts of the body.